Aloha and Welcome! 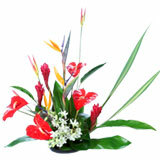 We are Hawaii's most established shippers of Hawaiian tropical flowers, serving the public since 1967. Your satisfaction is guaranteed or we will give your money back!